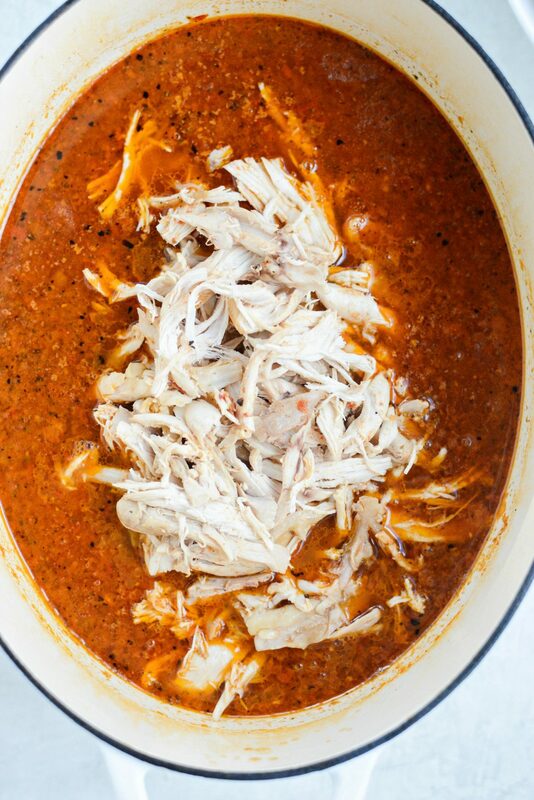 Chicken Tinga is Mexican shredded chicken. 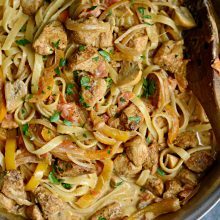 A whole cut up chicken simmers in a sauce of roasted tomatoes, onions and garlic with chipotles and broth until it’s falling off the bone tender. The chicken itself is smoky and mouthwatering delicious. 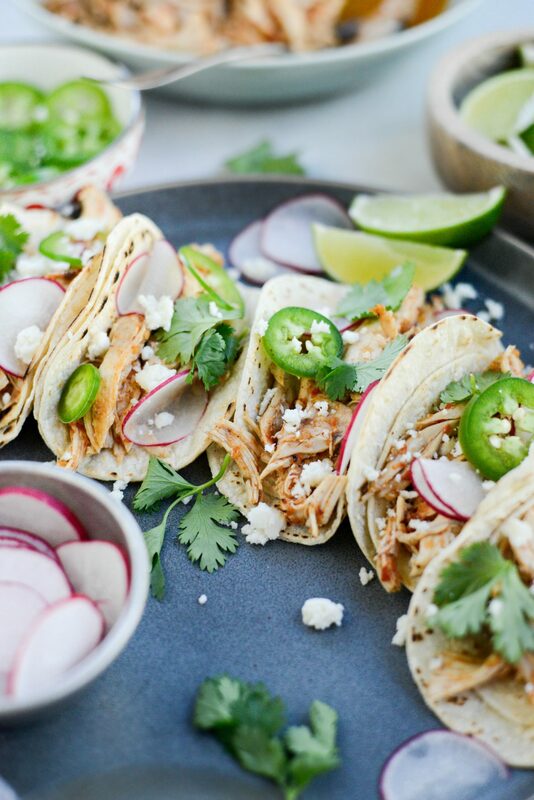 Chicken tinga can be stuffed in tacos, nachos, enchiladas or anything where shredded chicken can be used. If you’ve stepped foot into a Mexican restaurant and have ordered anything that is stuffed or topped with shredded chicken, there’s a good chance that saucy and flavorful chicken was indeed chicken tinga. So what actually is chicken tinga? 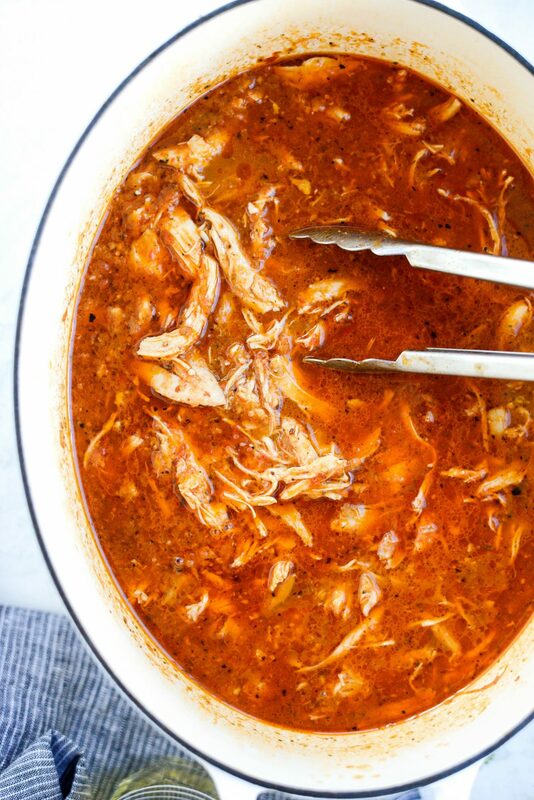 Well, only the most amazingly delicious slow cooked chicken. 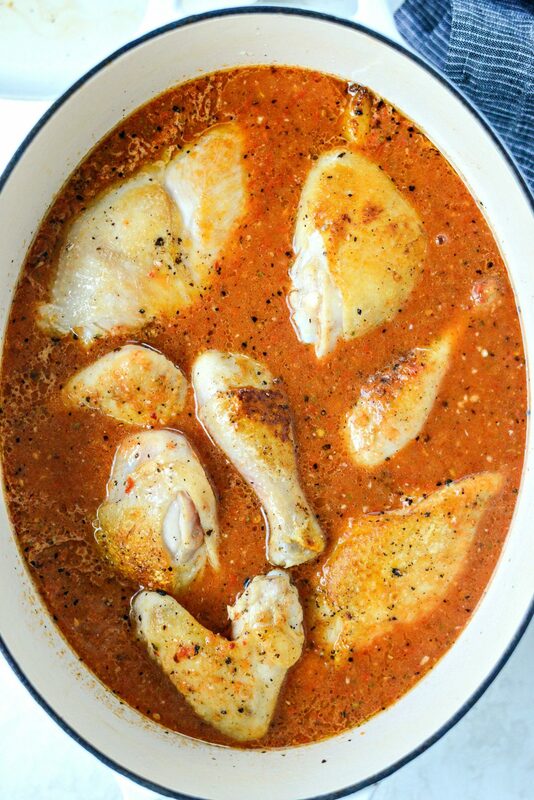 More technically, it’s a Mexican chicken dish in which chicken slowly cooks in a sauce of roasted tomatoes, onions and garlic, chipotles (in adobo), spices and broth. And it’s so easy. 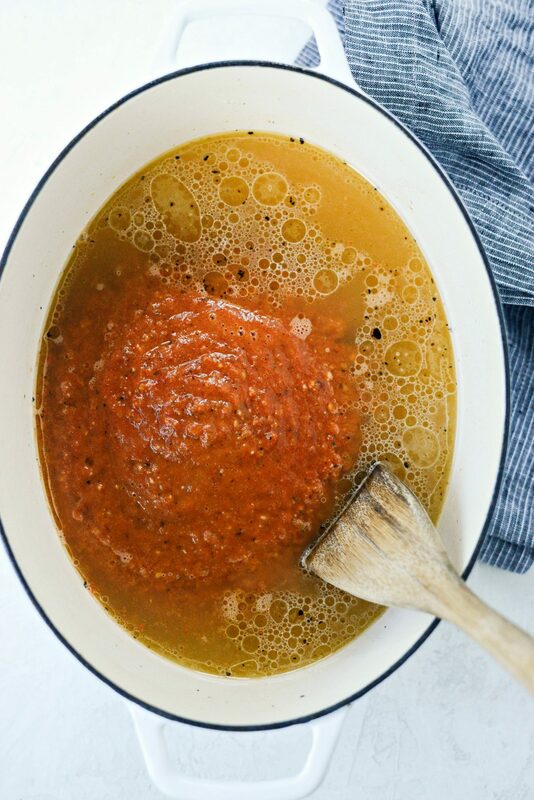 Here’s what you’ll need: 8 medium to large roma tomatoes, 1 medium yellow onion, 8 cloves of (unpeeled) garlic, 2 tablespoons olive oil, kosher salt and black pepper, 2 chipotle peppers in adobo sauce, 2 teaspoons Mexicali seasoning. To start, move the oven rack to the highest position in your oven and preheat your broiler to high. Wash and pat dry the tomatoes before cutting them in half. 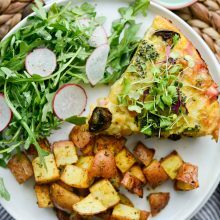 Place the tomatoes cut-side-down onto a large, rimmed, metal baking sheet. Add the chopped onion along with the garlic cloves (skin on) and drizzle with olive oil. Sprinkle with a few pinches of kosher salt before sliding the pan underneath the broiler. 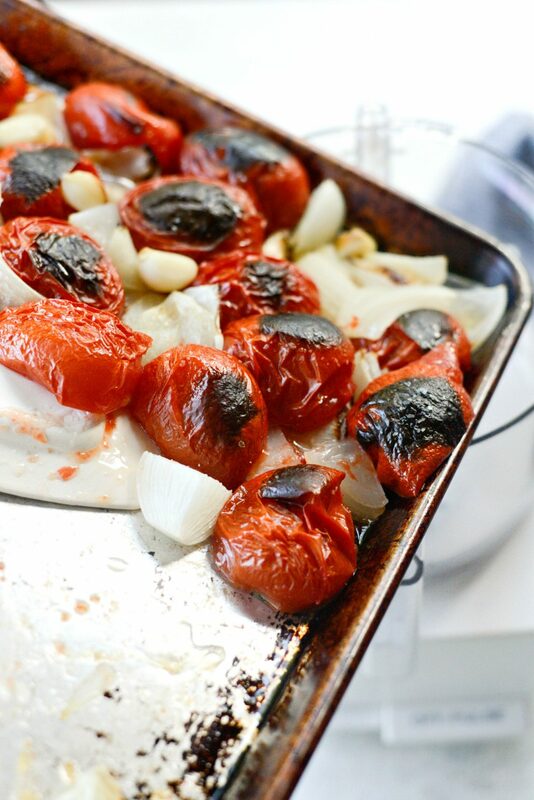 Broil for 6 to 8 minutes or until the skin on the tomatoes shrivels, blackens and the onions and garlic have browned a bit. Allow the tomatoes, onions and garlic to cool for a few minutes. 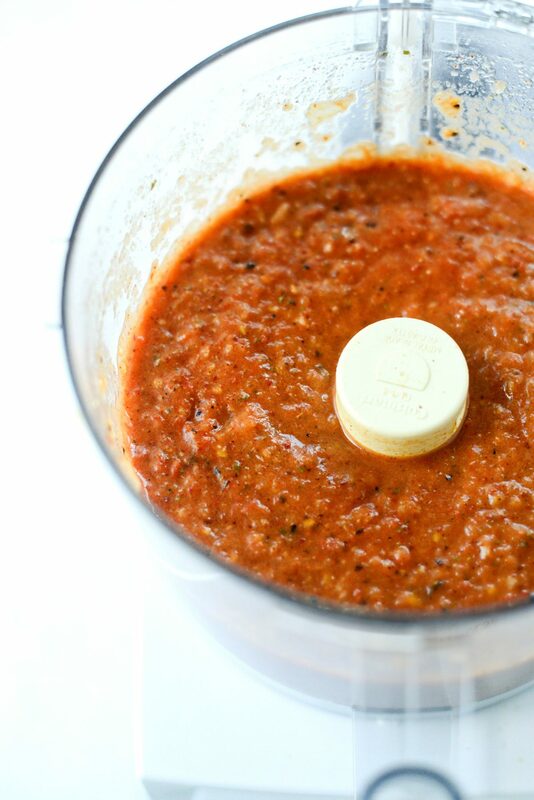 Once the garlic is safe to handle, peel and add it to the bowl of your food processor along with the tomatoes, onions, any juices that accumulated in the pan and 2 chipotle peppers and 2 teaspoons Mexicali seasoning. Next, puree everything until it resembles a smooth salsa. Then set aside. Next, heat 2 tablespoons of olive oil in a large, dutch oven over high heat. Meanwhile, season the cut up chicken pieces generously with kosher salt and pepper. Once the pot is hot, work in batches of two, searing the chicken on both sides until golden brown. Transfer the chicken to a clean plate and repeat with remaining chicken pieces. Once the chicken has been seared. 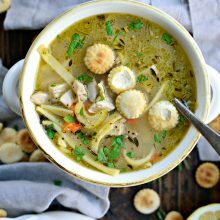 Pour 2 cups of low-sodium chicken broth into the hot dutch oven. Use a wooden spoon to scrape any brown bits off of the bottom. Then add in the roasted tomato/chipotle mixture and stir until combined. Next nestle the chicken pieces into the liquids and bring to a simmer. Cover and cook on low for 2 hours. 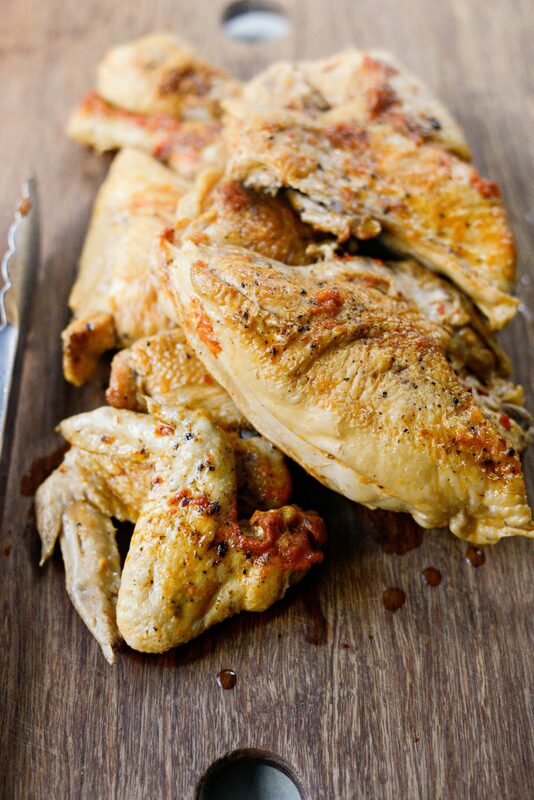 Once the chicken has cooked, use tongs to transfer it to a clean cutting board. When the chicken is safe to handle, remove and discard the chicken skin and use forks (or your fingers) to pick and shred the chicken. Next add all the shredded chicken back in to the pot with the cooking liquids. Keep warm until ready to serve. That’s it. 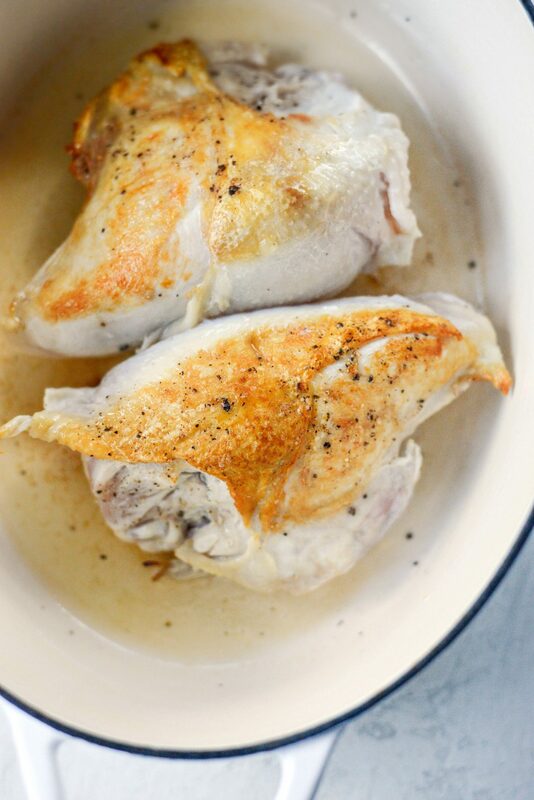 SO easy and you get the benefit from the mouthwatering aroma and endless ways in which you can use this chicken. We loved it in tacos and on nachos. Next we’ll try the chicken tinga stuffed into enchiladas and/or in burritos. Enjoy! And if you give this Chicken Tinga recipe a try, let me know! Snap a photo and tag me on twitter or instagram! Chicken Tinga is Mexican shredded chicken. 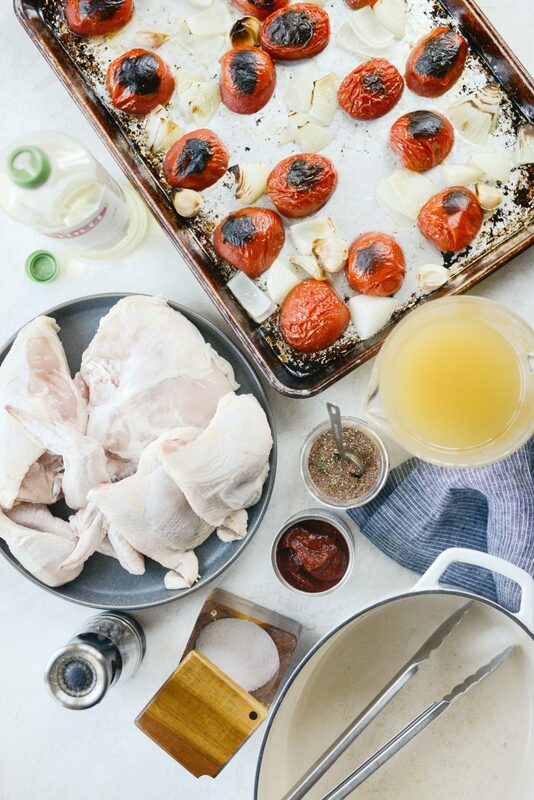 A whole cut up chicken simmers in a sauce of roasted tomatoes, onions and garlic with chipotles and broth until it's falling off the bone tender. The chicken itself is smoky and mouthwatering delicious. 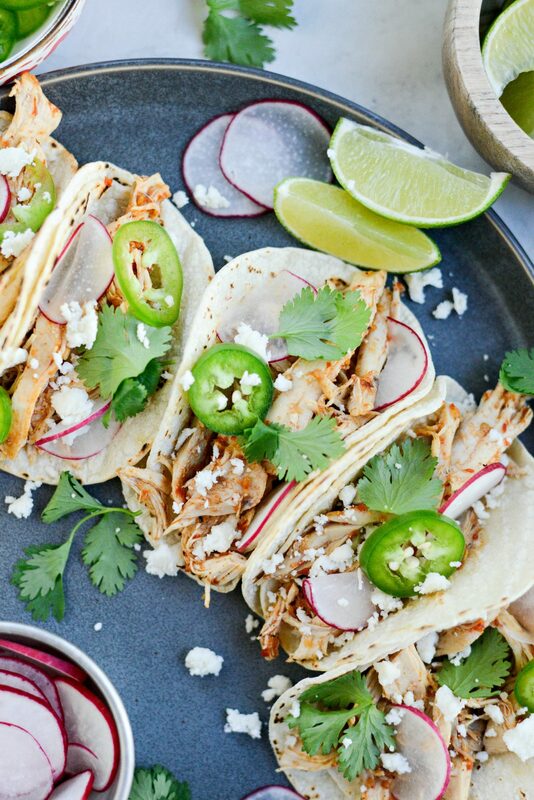 Chicken tinga can be stuffed in tacos, nachos, enchiladas or anything where shredded chicken can be used. Move your oven rack to the highest position in your oven and preheat your broiler to high. 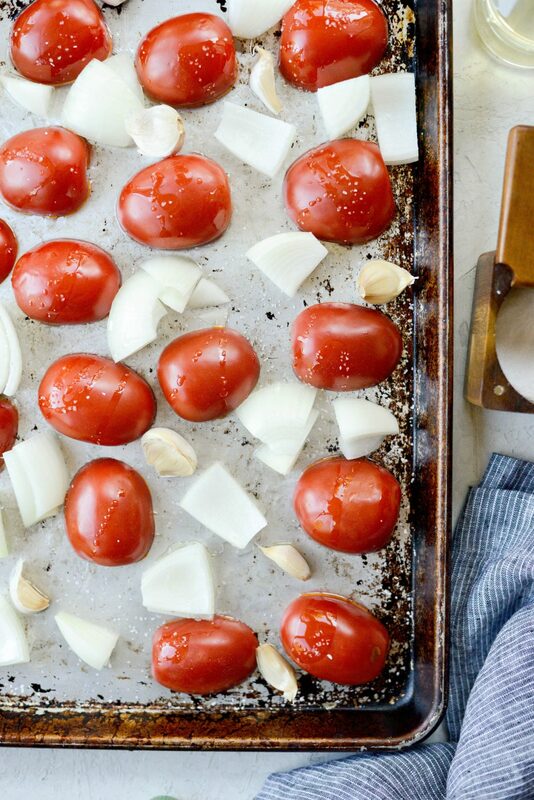 On a large rimmed metal baking sheet, place the tomato halves, onion and garlic cloves. Drizzle with olive oil and season with kosher salt. 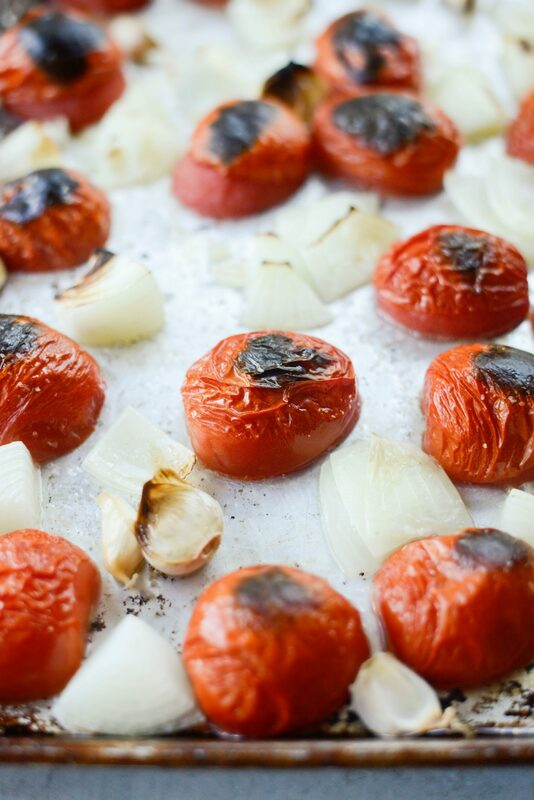 Broil for 8 minutes or until the skin of the tomatoes shrivels and is charred in spots. Allow to cool before peeling the garlic. 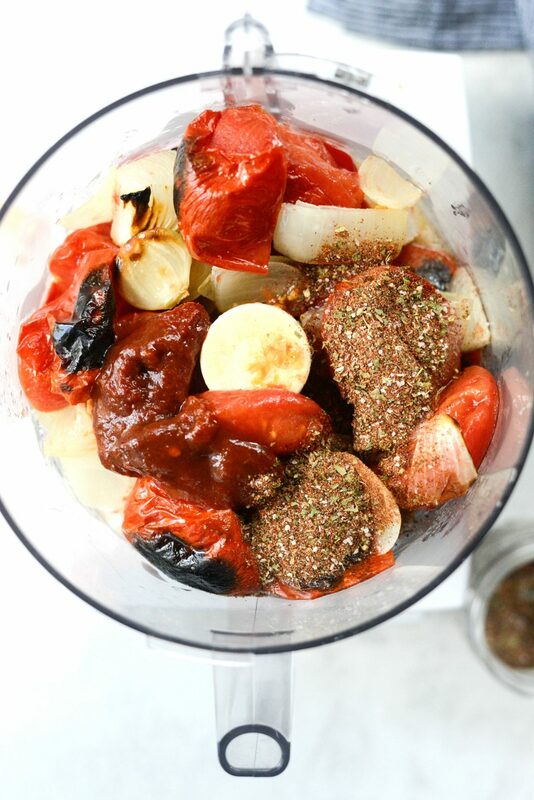 In the bowl of your food processor, fitted with the blade attachment, scrape in the tomatoes, onions and garlic. Add in the chipotle peppers and Mexicali seasoning and pulse until smooth. Heat 2 tablespoons olive oil in a large dutch oven oven over high heat. 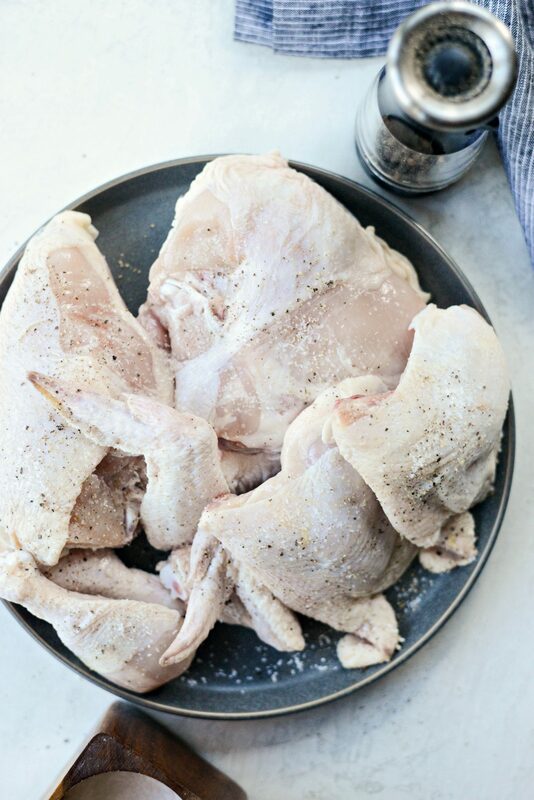 Season the skin side of the chicken pieces with kosher salt and freshly ground black pepper. 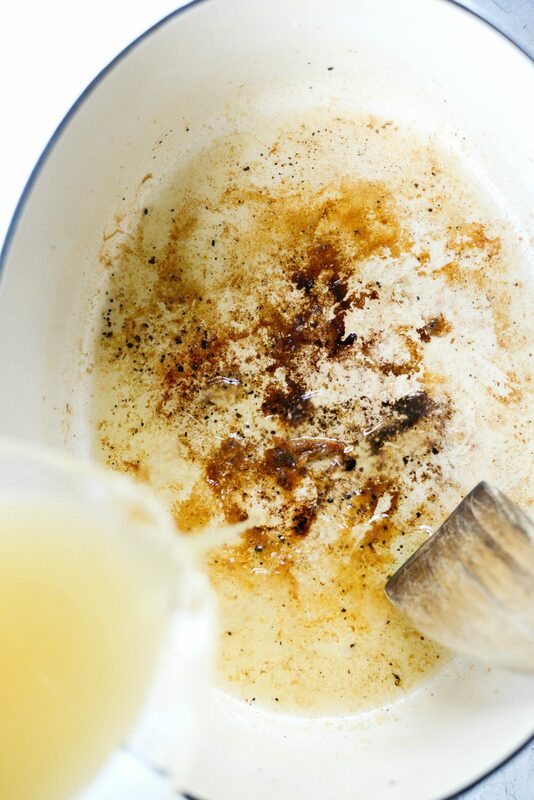 Once the oil is hot and shimmering, work in batches, placing the chicken breasts skin-side down in the oil. Seasoning the second side. Cook for 3 to 4 minutes or until it easily releases from the pot and is golden brown. Turn and sear on the second side for 3 to 4 minutes more. 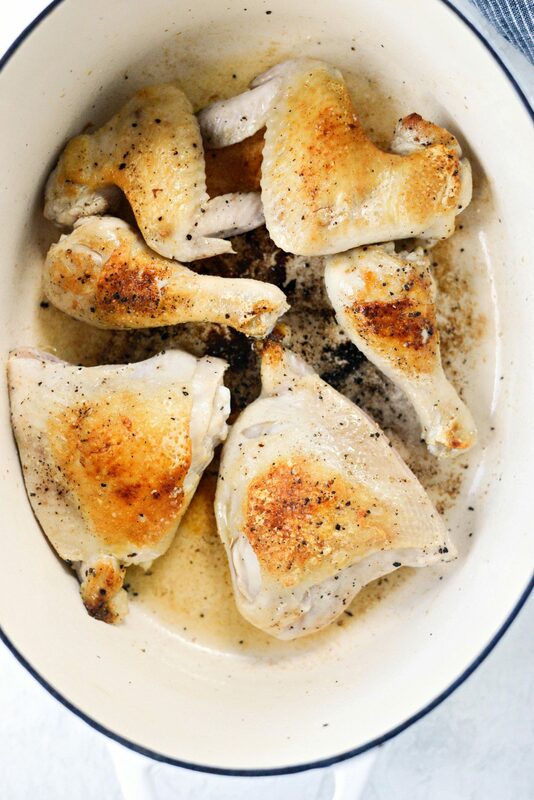 Transfer the chicken to a clean platter before repeating with the remaining thighs, drumsticks and wings. Once seared, transfer the remaining chicken to the platter. 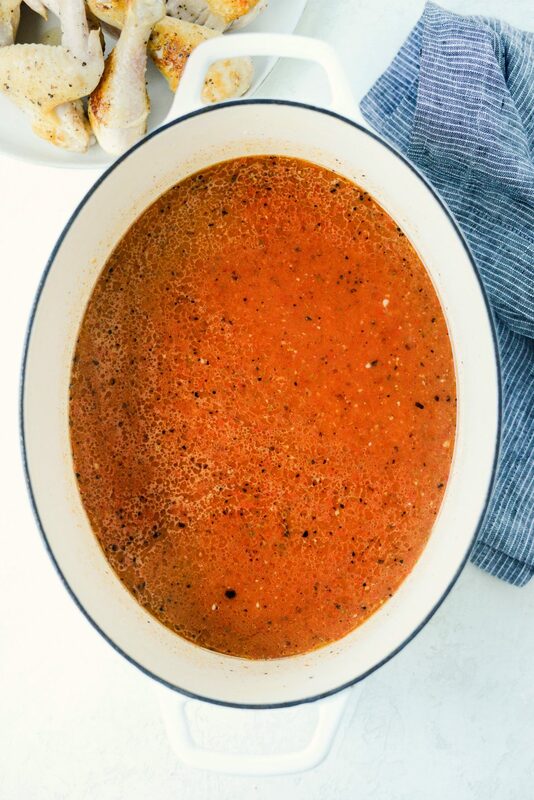 Reduce the heat to medium and carefully pour in the chicken stock and tomato/chipotle puree, using a wooden spatula to scrape the brown bits off of the bottom of the pot. Add the seared chicken pieces back in bring to a low boil before reducing to low heat, simmer for 1-1/2 to 2 hours. Use tongs to remove the chicken to a cutting board. Once cool enough to handle, remove and discard the skin. Pick the chicken off of the bone and shred. 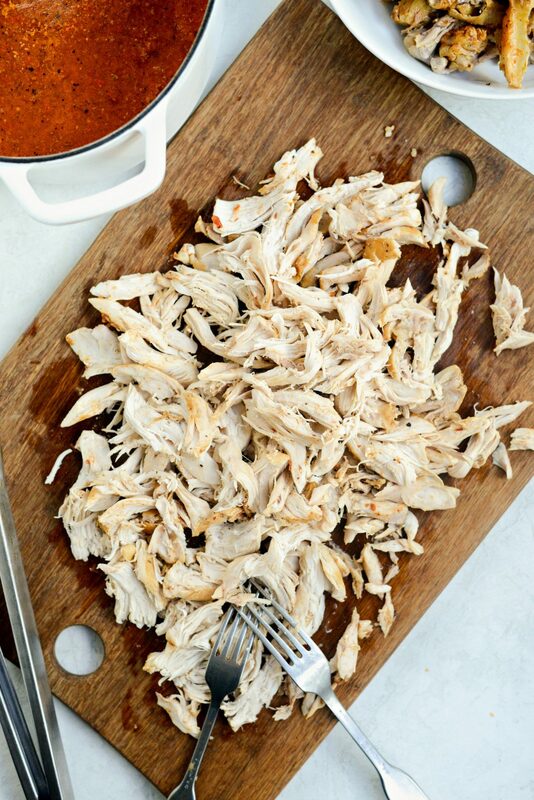 Discard any bones and add the shredded chicken back into the pot to keep warm. Season with more salt if needed. Chicken tinga can be served in tacos, on nachos or stuffed in enchiladas or burritos (or more!). Hi! I don’t have a dutch oven. 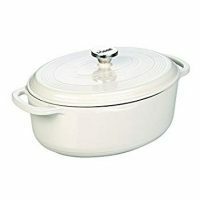 Would I be able to use a crockpot instead? Thank you! Hi Holly! I would think so. I would suggest searing the chicken in a pan first for that added flavor. Enjoy! Made it last night. Delicious! 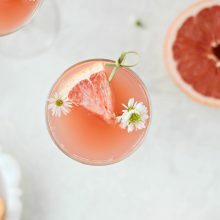 Recipe as stated, no changes. Easy to follow. I’m so happy to hear it, Deb! I made this! After I broiled the vegetables and seared the chicken, I put everything in the crock pot and then made tacos. Delicious! I’m so glad you enjoyed it, Heather! 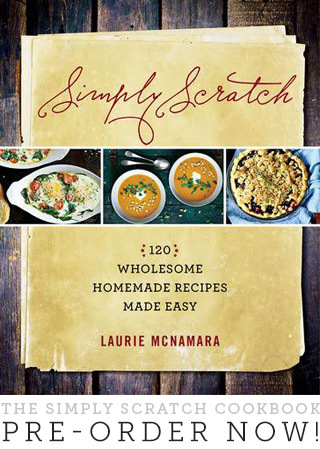 Thank you for taking the time to make the recipe and leave such a glowing review! Hi! I stumbled onto your website a few years ago and have always found something to make! You are AWESOME! 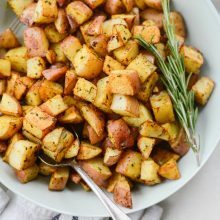 About this recipe, how spicy is this entree? My daughter loves Mexican but she and my wife cannot stand spicy hot food. Would you suggest reducing or taking out the chipotles all together help? Also wondering how long in the slow cooker this should be done on. To me this recipe isn’t spicy. However I have a sister who is super sensitive to spice, so I know how it can vary from person to person. I would suggest cutting back to 1 chipotle. 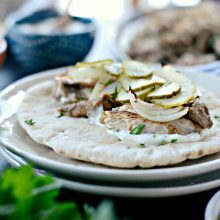 If making this in a slow cooker, I would think low for 6 hours would work. But I would still sear the chicken and broil the vegetables beforehand. I have not tested this slow cooker method, so I can’t be 100% how it will turn out -although I think it will be fine. Hope this helps! Enjoy!